I do love a good Aussie idiom, sadly they are no longer much used as we become increasingly globalised & homogenised. 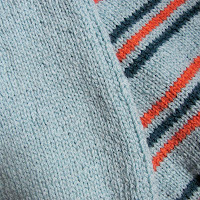 The Aqua plain & striped is a twinset - very vintage, very lady-like. The costume designer chose the design from a vintage pattern, she chose the yummy colours too. The yarn is 5ply (Sports Weight) which does give a lovely authentically vintage look (it drapes like thicker yarn never will) BUT thinner yarn = more stitches to be knitted and I've had to be almost machine-like in my hand-knitting to get it done - has taken 10days for the cardigan. 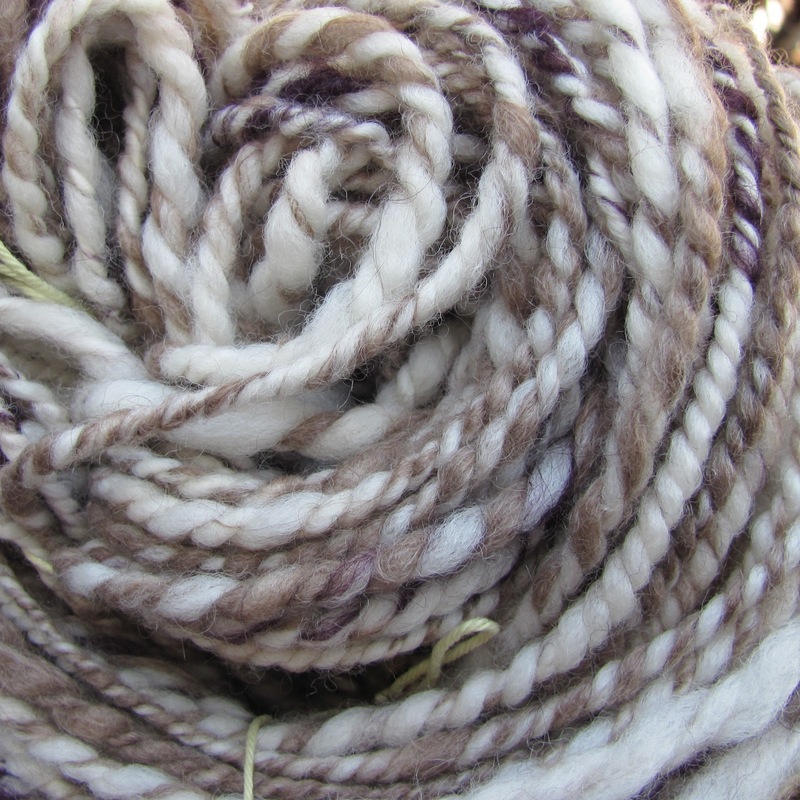 This soft brown with all the texture is, thankfully, in thicker yarn- 8ply or DK. 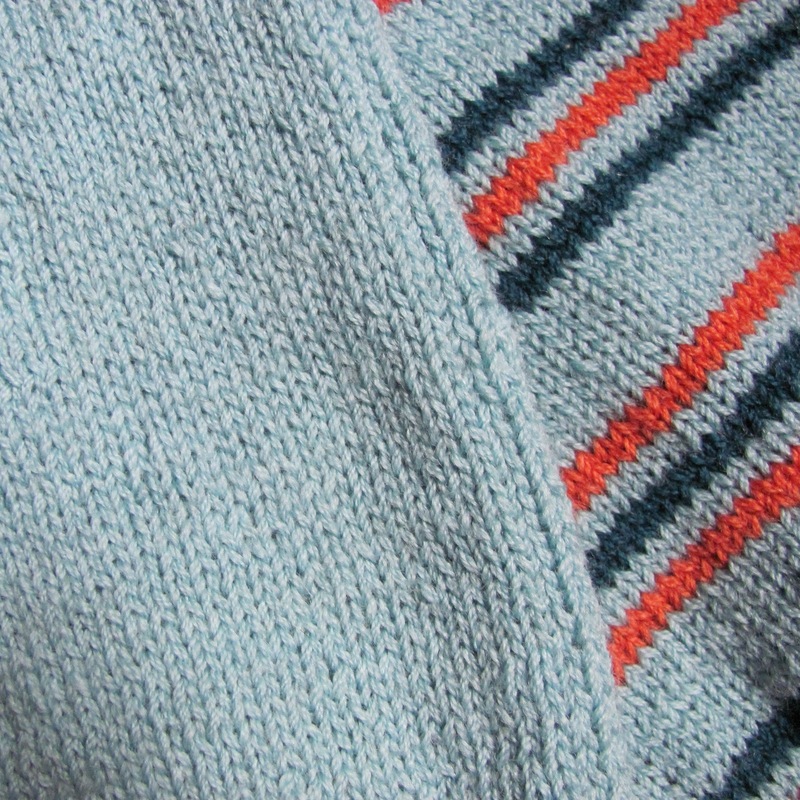 This is based on another vintage pattern (one in my own collection:-) ) but lots & lots of adaptation for this as the original pattern was for sock-weight yarn. 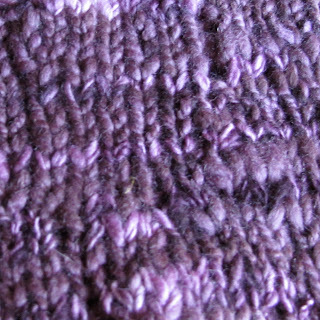 I've adapted the stitch as well, as knitting with twice the thickness of yarn makes a stitch pattern so much larger - it would not have looked vintage at all. 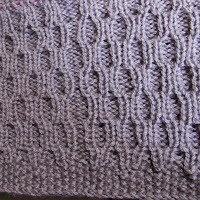 Even with the highly textured stitch which is worked as a cable, this garment seems to be flying along after the slow progress of the thin-yarn cardigan! 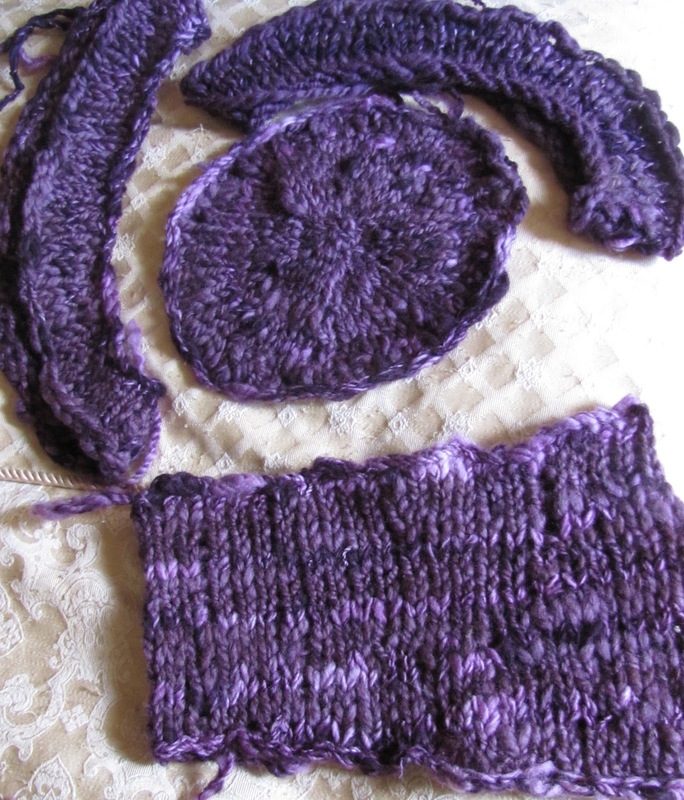 In amongst all of that - I'm also making some more Knitted Cashmere TopHat coverings. I made the first one last year and posted about it here - now they want 2 more Top Hats. 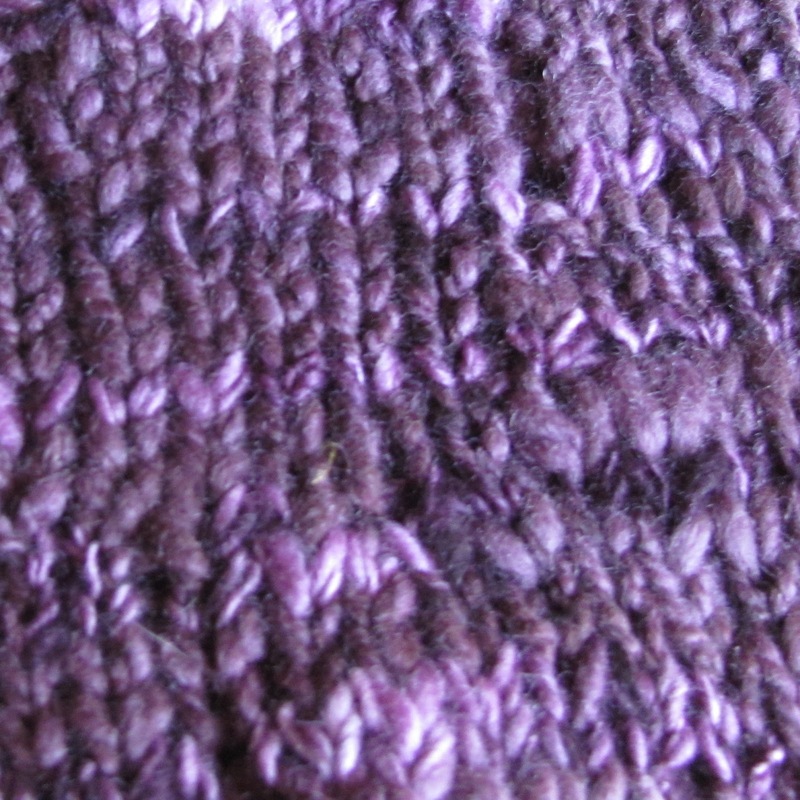 The first a rush-job and purple - not a bright psychedelic 1970s purple but a softer, rustic, crushed berries colour. 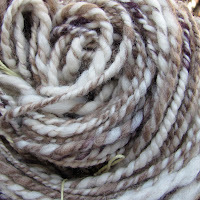 Of course I was nearly out of Cashmere fibre and had to order some in (from Belisa) then I spun it nice and chunky / rustic with about 40% sheep wool. The cashmere is the brown - that is its natural colour and it is really soft, like spinning with cloud! Then I dyed it purple and knitted all the shaped pieces - the knitting is probably the fastest part of the whole process! 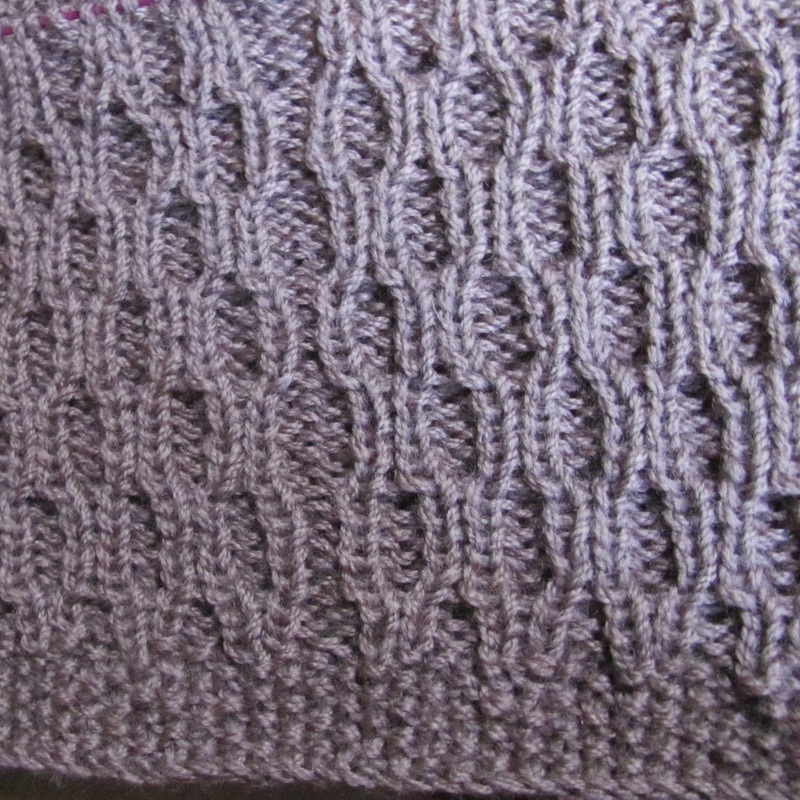 Here they are after blocking. And now for something non-knitty. 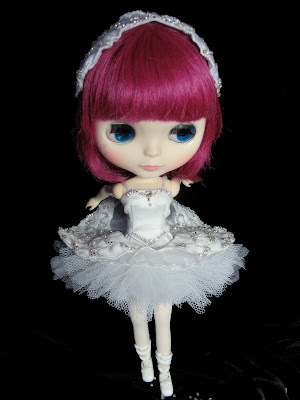 Here is the complete finished tutu costume ... Odette, the white swan in Swan Lake, for Blythe. I sold this costume on my new Etsy shop for BlytheStar within 3hours of listing it - hope the new owner loves it all as much as Violetta did! 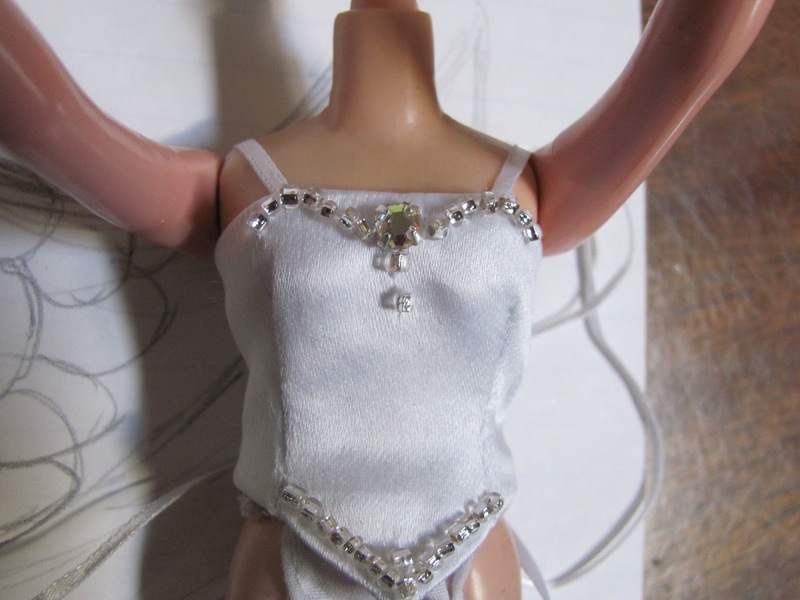 And the lacing up the back - I had wanted to use metal eyelets but couldn't get any tiny enough that actually function without getting really rough on the inside - don't want to scratch Dolly's back. 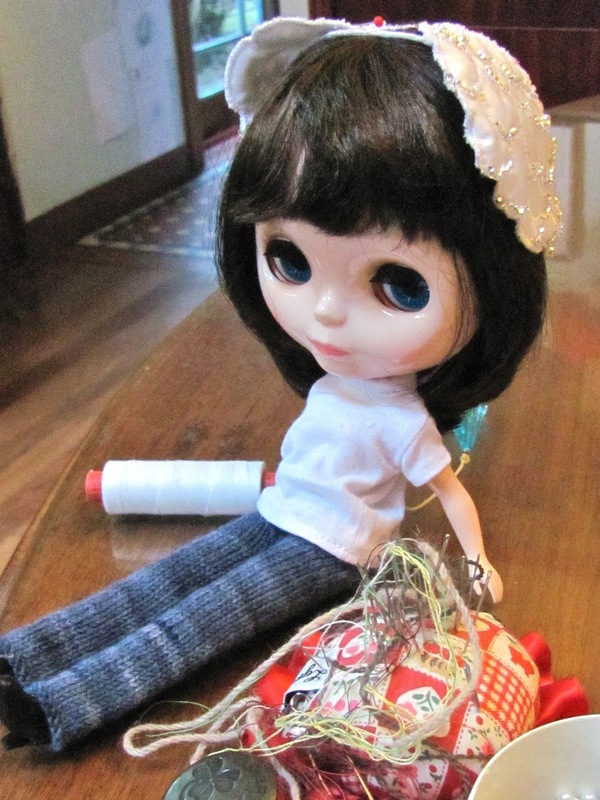 Though, to be honest something worse than scratches has happened to the doll in these pics !! 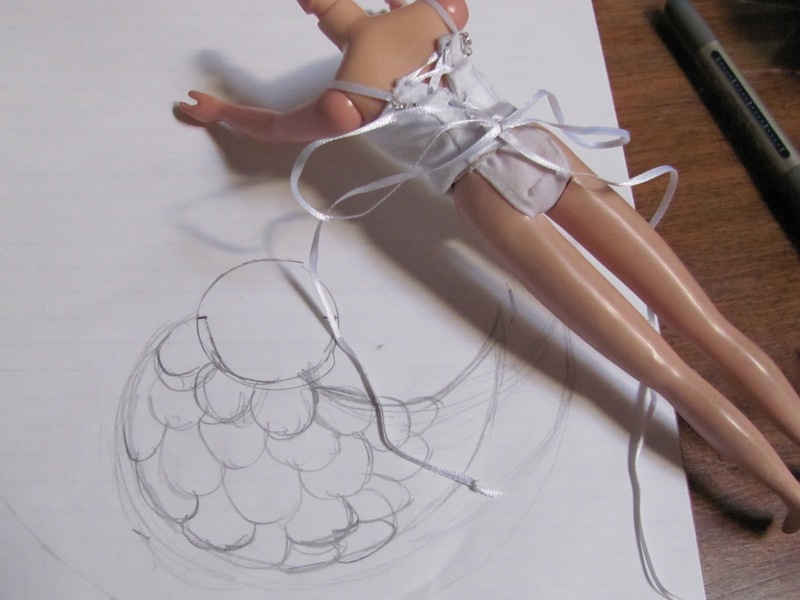 There I've been drawing the 'wing' design for the top layer of the tutu. 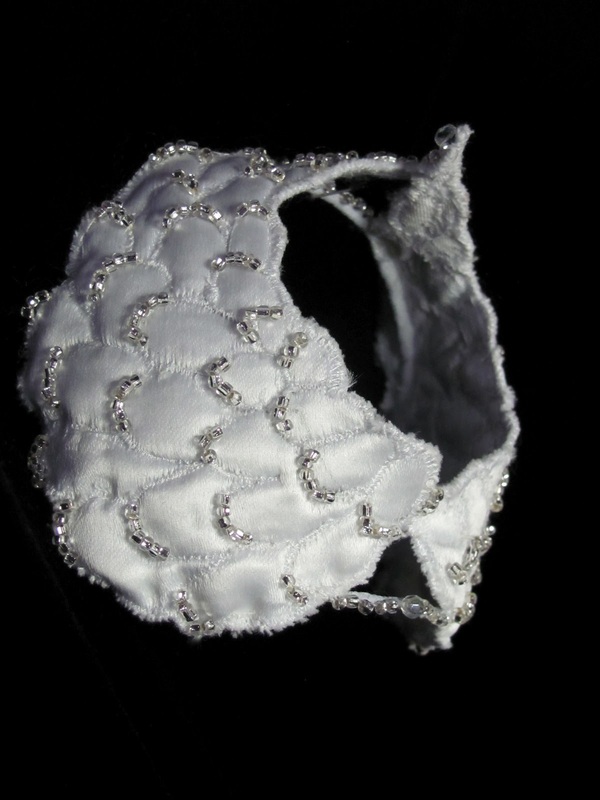 The 'wings' are lightly quilted satin and heavily beaded with lovely silver-foiled glass seed beads. 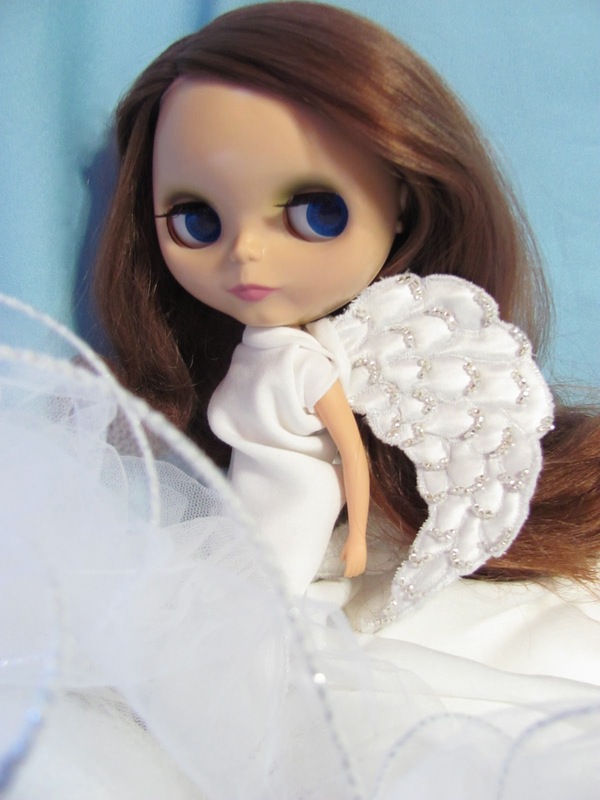 And yes, Lillian borrowed them for her Angel photo. 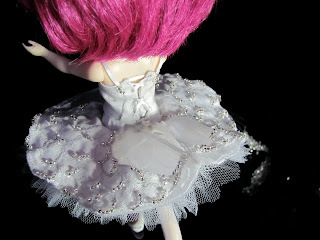 I used the same 'wing' idea for the head-dress - always a very important part of a classic ballerina Swan costume. Audrey helped me to get the shapes correct. 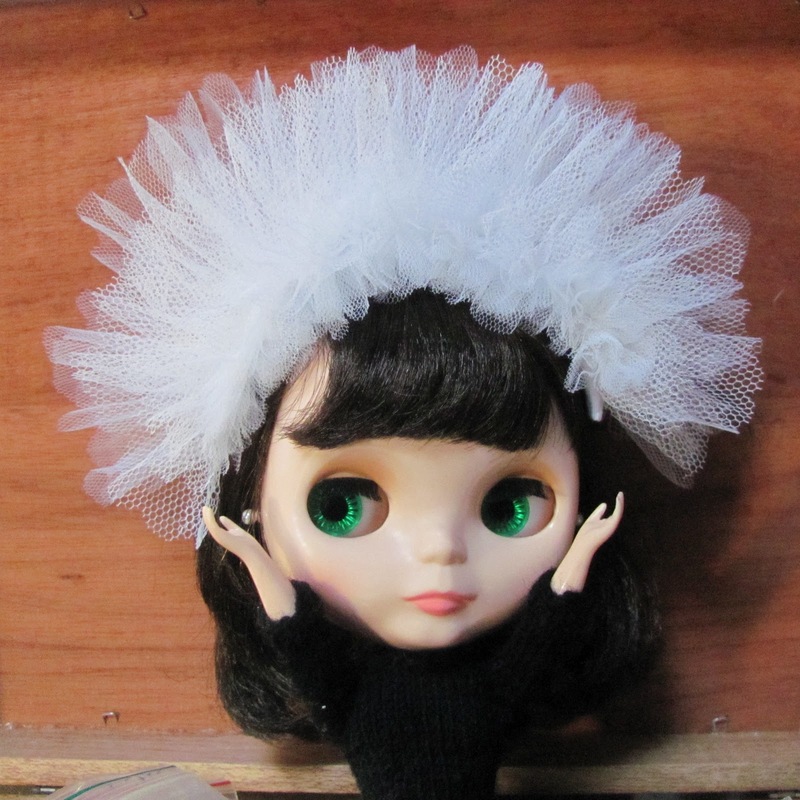 The head-dress finished, it sits on a Blythe head without needing pins or things. 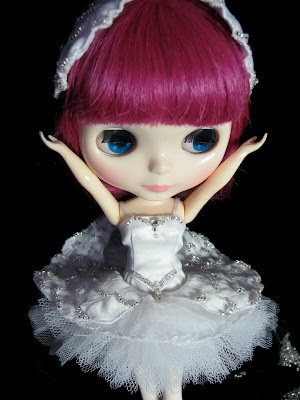 You've done a wonderful job of the costume Lyndell, it's lovely!